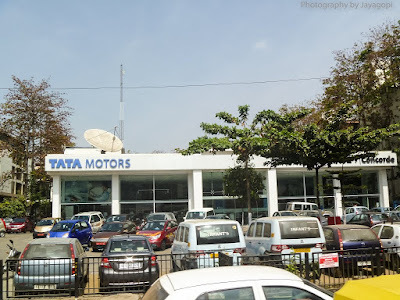 Concorde Motors alongside Tata Motors, Dairy circle, Bangalore, India. A very efficient and customer friendly shopfloor environment that I have seen is the Tata Motors Service showroom of Concorde Motors in Dairy Circle, Bangalore. The moment you enter, these is enough communication media that tells you where to go and whom to contact. The ambience of the place is great and there are enough areas for the customer to sit. In front of the customer representatives there are enough chairs to make him comfortable. The counter clerk is an enthusiastic young lady. The coffee machine has an attendant to serve the customer or the customer can self-operate it any time. The customer representative notes down systematically the customer issues and directs him/her to the right department. An accurate analysis of the work involved is arrived at by the employee along with the approximate rates and delivery dates and informs the customer who then takes leave. This is an environment which nobody can find fault with. 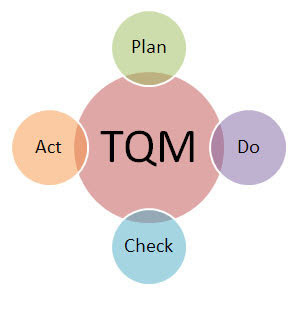 So comfortable, cool and customer friendly..
Total Quality Management (TQM) is based on the Deming Cycle famously referred to as the PDCA cycle (Plan-Do-Check-Act). It is also completely based on customer satisfaction .. If you look at the 8 processes and try to find what are the functions of each of these and how they contribute to the whole, we find TQM is nothing but an orderly and disciplined customer-focused, employee enriching fact-based control system that has a relentless focus on improvement and great communication. Click here for a good video ..
What are the pre-requisites one needs to acquire and master before embarking on a journey of Total Quality Management. ? Of late we have Quality Management Systems which are systems that help organisations be systematic and orderly, but rarely it beings focus on customer satisfaction and employee enrichment. Even the Malcolm Baldridge Quality Awards or the Deming Prize concentrate fully on orderliness, processes, and customers, with a very small emphasis on employees ..
Great focused Leadership emphasising on the need to deliver the best quality to the customer by all counts and excellent long-term relationships with suppliers are two additional areas which are not emphasised here, but which carry great importance. For a University aiming to be among the top 20 of the world by 2030 AD, what are the planning and activities it needs to carry out ? 1. Everyday you take tea from the college canteen. Analyse each of the eight factors and prepare a strategic plan, how the tea stall owner can deploy TQM in his organisation and see that it thrives. 2. When you fall sick, you visit the hospital nearby. Prepare a TQM plan for the hospital, list out the tools you would use to deploy TQM in its different phases. Click here for great ASQ TQM resources..